Honestly, I'm a loser when it comes to horror movie but I do love watching them. I don't enjoy it entirely, but as a movie lover, I like to think about the effect it gives me. Not ghost effect but the production like camera angle, the sound effect, the story line. You can count how many horror movies I watched in my entire life. Probably lower than normal people do. But when I do, I take it seriously :)) this sentence makes me laugh just like it does to you probably but really! From all horror movie I've ever watched, The Babadook (2014) gives so many scariness because its story and the production. It seems okay at first, but as the story goes, my mind and my body react to how scary the story is, the creepy but perfect camera angle and of course, the sound effect that completed the whole eerie air around me. The story is simple but original, that's why it is so terrifying! 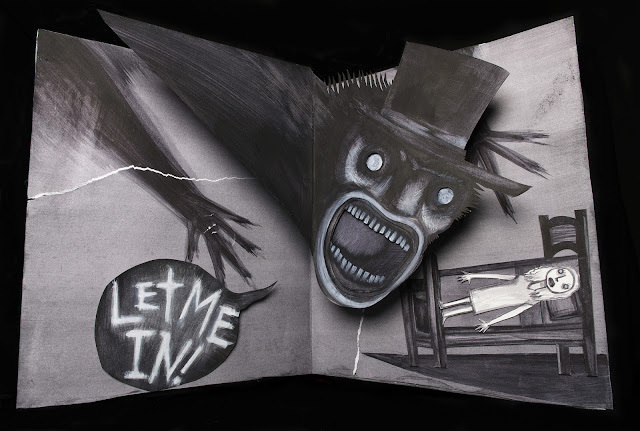 This movie doesn't have scary ghost like others, but holy moly, for me The Babadook is scarier than those jump-scare movies!